Thank you, as always, to those who participated in January's book club read, "Watchmen" by Alan Moore. I hope it was enjoyable, and has also whet your appetite for the forthcoming blockbuster based on the graphic novel. But now, February dawns, and the book club is returning to an author we first looked at right at the start when the book club first began (August I think it was). 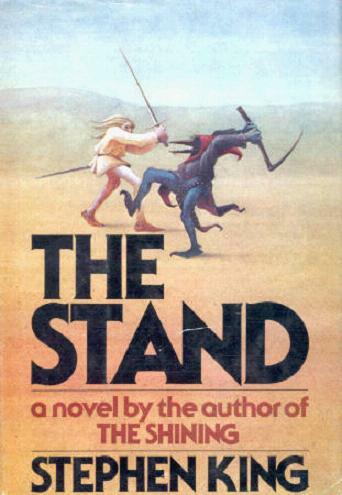 Yep, after last year's Carrie, we're now reading "The Stand" by Stephen King. Early reports suggest this book has more LOST connections than you can shake an Eko stick at. The writers themselves have also been quoted as saying how important this book was to them in influencing the show - so this read should be quite enlightening... we hope. At over 800 pages long, it frickin better be. If you'd like to take part in this book read, it's not too late. The forum thread for this book HERE is open all month (and after - though there'll be less activity). You can also propose future reads HERE. A final note - as usual we give you a month's advance notice before a new read - and it's with pleasure that I can say March's read is... "Ulysses" by James Joyce! In keeping with the Season 5 theme, we're going into the future - as this book hasn't actually happened yet on LOST. Mr Damon Lindelof and Mr Carlton Cuse, however, have stated that it will appear soon during a video blog they conducted on LOST books. So, in anticipation of the book, we're reading it ASAP to see if we can gleam anything before it appears on the Island. Apologies if you are now "spoiled" by that revelation - but for God's sake it's just a prop! So anyway, if you are not spoiled and excited about this read - then do acquire it now in prep for March. Buy the book at Amazon, or borrow the book from a US library (internationals, see regional Amazons, etc).